CANCELLED: Join us at MONAH for another exciting installment of our Native Conversations Series, SATURDAY, February 23, at 6:00 PM. Kiowa artist Travis Mammedaty will explore the history, culture, and protocol of songs for use in powwows. 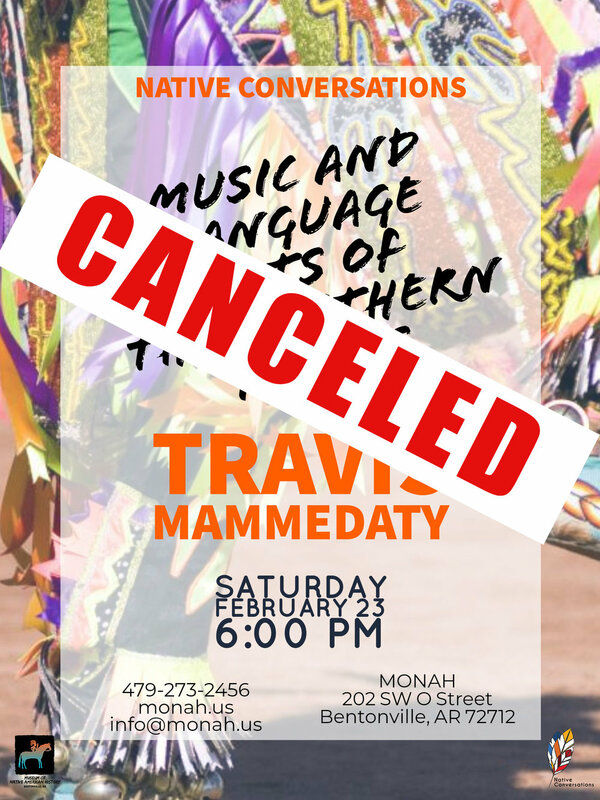 Due to unexpected scheduling factors, we must announce the cancellation of Native Conversations: Music and Language Arts of the Southern Plains with Travis Mammedaty, scheduled for Saturday, February 23, 2019. MONAH continuously strives to deliver inspiring and fantastic events for all of our guests and community partners. Thank you for your tremendous support and we look forward to seeing you at our next event and in the museum. If you have any questions or concerns regarding this cancellation notice, please contact the museum at: info@monah.us or 479-273-2456. FREE; Open to the public. Registration encouraged.